I am a huge Thomas Keller fan. I am absolutely ga-ga over his restaurant Bouchon. When I last went to Las Vegas, I ate there every day. To see why I went there every day, click here. I also have the French Laundry, Bouchon, and Ad Hoc Cookbooks, and they have an honored place in my kitchen. 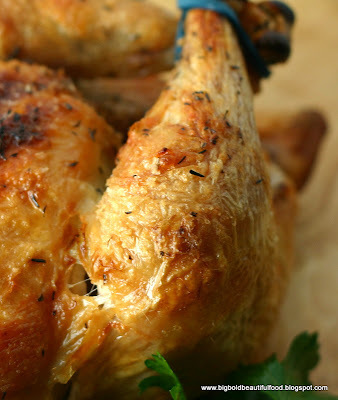 Thomas Keller's high heat roast chicken is one of his famous dishes, because it's easy and flavorful. My friend Tania, after learning this recipe from me, says she makes it every week. 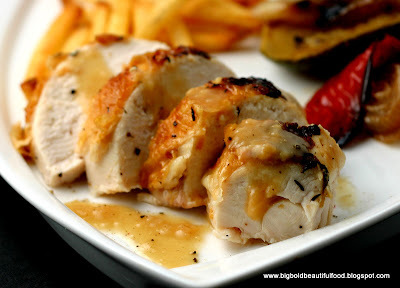 Since I'm making this chicken tonight, I will share again my post on this chicken. I hope you will try it! On the way home from school, I stopped at a local grocery store to pick up a rotisserie chicken. My younger daughter said, "You say the chickens are really small here, and they're expensive." I replied, "Well, I'm not going to drive to Costco to get a cheaper chicken." But when I went into the deli section and found my hand hovering over the $7.99 miniscule, wrinkly chicken, I knew that my wise daughter was right. She knows me very well. I came out with a farm-raised, no antibiotics whole chicken. What a great opportunity to try out Thomas Keller's legendary roast chicken, which uses only salt, pepper, thyme, and a 450 degree oven. It cooks under an hour. Whoa, this chicken is divine! A must try. Crispy. Succulent. Delicious. I served it with pommes frittes (well, they were frozen Ore-Ida french fries aspiring to be pommes frittes - :)), leftover pan-grilled vegetables, and a gravy I made from the pan juices. Kitty also got a gourmet meal out of the chicken liver in the giblets package, which were simmered with peas and orzo and then ground into a yummy cat mash. 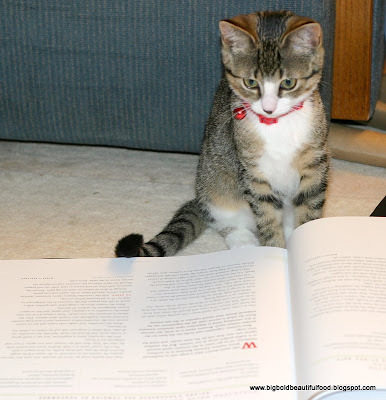 Kitty reading Thomas Keller's Bouchon Cookbook, which I got for my birthday. 1) An organic or farm-raised chicken is a must, 3 lbs. max. Those mega-brands pump liquid into the chickens, and the natural chicken tastes much better. 2) A dry chicken is a crispy chicken. Make sure you super dry the chicken off. 3) Don't skimp on the salt. A good amount of kosher salt (1 tbs. or a little more) is needed to flavor the whole chicken. 4) Be prepared for your oven to need a run of the self-cleaning cycle after you make this spatter-inducing chicken. Rinse the chicken, then dry it very, very well with paper towels, inside and out. 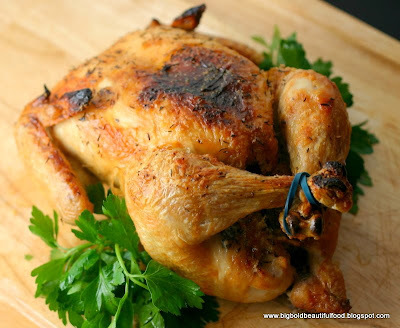 Let the chicken sit out for 20-30 minutes before roasting, so that it gets to room temperature. Generously salt the chicken with kosher salt, inside and out. Remember that the salt needs to flavor the whole chicken. If you're using dried thyme, sprinkle thyme on the chicken and rub it in with the salt. Season with freshly ground pepper. Truss the bird and put on a rack. (I used a silicone rubber band to tie the legs and then I put crumpled aluminum foil under the sides of the bird, which helped push the wings against the body. The foil also acted as an impromptu rack.) Put it in a roasting pan. Roast it until it's done, 50 to 60 minutes. When it's done, the chicken will register 155 degrees with an instant thermometer between the thigh and leg. When it rests, it will reach a temperature of 165 degrees. Remove it from the oven. Baste the bird several times with the juices. If you're using fresh thyme, add it to the juices before you baste the bird. Let it rest 15 minutes. Your chicken looks amazing. Such a gorgeous color. I'm bookmarking this. Hard not to fall in love with Thomas Keller's recipes, right? Starting out with an organic bird sure is a huge head start in the flavor/tenderness department. Cooking the bird at a high temperature yields such a beautiful color. I've already had dinner and now I am hungry again! This looks fab Ninette - I think for such a simple dish you really need to buy the best chicken that you can afford!